President Donald Trump said on March 2 he would soon sign an executive order requiring universities and colleges to protect free speech on campuses or risk losing federal research funds. Trump made the announcement at the annual Conservative Political Action Conference (CPAC) after bringing to the stage Hayden Williams, a conservative activist who was punched in the face at the University of California–Berkeley last month while recruiting students for Turning Point USA, a conservative group. “Today, I am proud to announce that I will be very soon signing an executive order requiring colleges and universities to support free speech if they want federal research funds,” Trump said, drawing cheers and chants of “U-S-A” from the audience. If universities do not comply, “it will be very costly,” the president added. The government awards universities more than $30 billion annually in research funds. The White House did not immediately respond to a request for comment on details of the order. The University of California said the attacker, 28-year-old Zachary Greenberg, was arrested on March 1 and released on bail, according to Campus Reform. The university issued a statement condemning the attack shortly after videos of the incident surfaced on social media. Turning Point USA is one of the largest conservative student organizations, operating on 1,400 campuses. The group’s founder and president, Charlie Kirk, spoke at CPAC two days before Trump. American universities are overwhelmingly liberal. Only 12 percent of undergraduate faculty identified as conservative, compared to nearly 60 percent who identified as left or far left, according to a 2013-2014 study (pdf) by the University of California–Los Angeles. Liberal professors dominate the faculties of Ivy League schools. A Harvard faculty survey found that more than 83 percent of the professors at the university identified as liberal or very liberal, while less than 2 percent identified as conservative or very conservative. The liberal constituency of the colleges has resulted in a variety of policies and mechanisms stifling free speech, including “safe spaces,” “gender identity” policies, and “hate-speech” codes. If universities “want our dollars—and we give to them by the billions—they have to allow people like Hayden and many other great young people and old people to speak. Free speech,” Trump said. 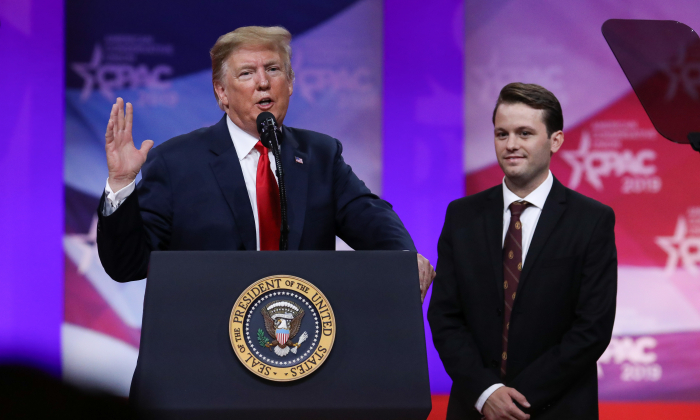 “It’s great that I’m being recognized, but there are so many conservative students across the country who are facing discrimination, harassment, and worse if they dare speak up on campus,” Williams said on stage at CPAC as Trump looked on. “If these socialist progressives had their way they would put our Constitution through the paper shredder in a heartbeat,” Williams said. The Justice Department filed a statement of interest in 2018 in a free speech lawsuit filed against the University of California–Berkeley, accusing the school of discriminating against speakers with conservative views. In a settlement, the school agreed to change its policies and pay $70,000 to cover legal costs of the Berkeley College Republicans and the conservative Young America’s Foundation.